· STAY DRY ON A RAINY DAY: Don't cancel your plans just because it started raining! All you have to do is wear this stylish waterproof jacket above your clothes and go out! The black jacket and its hood will keep your upper body and head dry and clean! · THE MOST COMFORTABLE DESIGN: This Omni-tech has underarm venting with a soft zipper to keep you cool and comfortable. The front zipper of the waterproof coat is covered, so that raindrops and the wind won't pass through. For optimal comfort, Diamond Candy has added a brush knit chin guard to the zipper of the jacket. 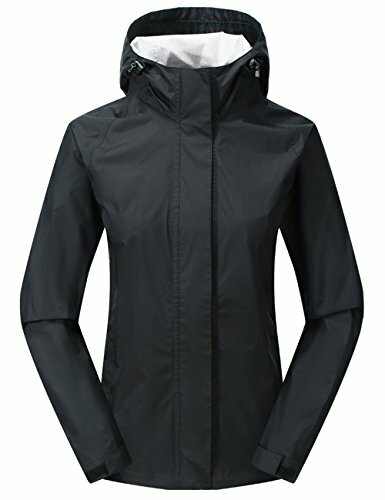 · IDEAL FOR OUTDOOR ACTIVITIES: This women's jacket is perfect for outdoor activities!You can therefore wear it over your clothes when you go hiking, fishing, traveling, playingsports, running, camping, walking your dog, and on many other occasions. · LIGHTWEIGHT PACKABLE JACKET: The single-layered hooded jacket is incredibly lightweight, and once folded it doesn't occupy too much space. In this way, you can easily store it in a drawer, put it in your luggage when you travel, or simply put in your bag before you leave the house and go about your day! · 100% RISK FREE PURCHASE: Are you unsatisfied with the premium quality of the jacketfor women? Diamond Candy offers you a 6-month satisfaction guarantee, making this acompletely risk free purchase, so don't hold back any longer! If you have any questions about this product by Diamond Candy, contact us by completing and submitting the form below. If you are looking for a specif part number, please include it with your message.